A neck support caul is quite easy to make with a cove cut made on a tablesaw. For details on how to make a cove cut see below and/or consult any good book on joinery. 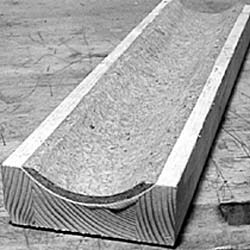 For a cove cut a block of wood is moved several times across the sawblade at an angle; the blade is set slightly higher for each pass until the channel is the right height and width. Using clamps and a plastic tube as a clamping caul a layer of cork is glued into the channel. Under pressure, the tube, which should be about 100mm (4") in diameter, will adopt the shape of the channel.